In the NFL about this time of year, dreams die. That is, another team loses and is knocked out of the playoff race. Their dream of making it into the playoffs and hopefully getting to the Super Bowl can vanish in a weekend. However, does that mean that the dream really died? Not at all. Pretty soon every team will begin to strategize for the next season, the next run. And the dream will live again. Now Joseph had a dream, and when he told it to his brothers they hated him even more. He said to them, “Hear this dream that I have dreamed: Behold, we were binding sheaves in the field, and behold, my sheaf arose and stood upright. And behold, your sheaves gathered around it and bowed down to my sheaf.” His brothers said to him, “Are you indeed to reign over us? Or are you indeed to rule over us?” So they hated him even more for his dreams and for his words (Genesis 37:5-8). Then through a series of incidents he found himself in an Egyptian prison. The years passed. As he sat in the prison cell I can imagine his dream continually surfaced in his mind. I wonder, did his dream ever die? After a series of providential circumstances Joseph not only got out of prison, he rose to an unprecedented level of authority. Now Joseph was governor over the land. He was the one who sold to all the people of the land. And Joseph’s brothers came and bowed themselves before him with their faces to the ground (Genesis 42:6). Maybe your dream didn’t die. Maybe its just not the right time. As you get ready to begin a new year, maybe it’s time to dream again. Our phones and social media have transformed the way we communicate, connect, receive the news, and stay in touch. In short, we cannot be separated from our phones anymore. Just two decades ago if you wanted to meet someone for lunch you had to plan well in advance. Not anymore. And chances are you will not call. You will text. Yes, you are only a text message away from a lunch date. We call it a phone, but in truth it’s far more. In fact, few of us actually talk on it. But with all the positives comes the negatives.One downside is that now you can easily find out what people are saying about you. That is, if you are fairly well-known. Sports players regularly check their phones to see what others are saying about them. Now you know that’s not healthy. After all, if you are famous, the haters abound. Which leads me to Kevin Durant, unquestionably the second greatest basketball player in the world at this time. “Second best!” How would you like to be the second best in the world? At anything? However, as with every other thing on social media, things get magnified. Apparently, Kevin Durant is sulking and emotionally hurt by all the negative comments about him on social media. So why is he reading those things? Makes no sense. And he is not the only one. Even NFL players have been known to check their phones during halftime! Things have gotten totally out of hand. But the only remedy is for players to avoid their phones, or at least the “mentions” about them. Otherwise their confidence will plummet and they will spend needless hours distressed by all the negative comments. Social media can destroy the confidence of even the greatest stars of our time. So what about the rest of us? Bottom line: proceed with caution. If you sense harmful effects after your time on social media, maybe you need to think about changing how you use it. You and I know people whose faith has failed. Perseverance can be hard. Joseph in the book of Genesis sat in a prison cell for well over a decade, but he eventually became a ruler in Egypt. And there are perseverance examples outside the church world. In history and archaeology, King Tut was almost not King Tut. What I mean is today he is known around the world…but only because one guy persevered. In 1904 at the age of 31, Howard Carter had no job and no money, so he left the field of archaeology. In 1907 a series of fortuitous events got him connected to the wealthy Lord Carnarvon. At the same time another archaeologist, Theodore Davis, assumed there was nothing to be found in his search and gave up his rights for his digging area. Carter took over the spot and began years of digging. In 1922 Lord Carnarvon told Carter he was done. You have to have money, so Carter pleaded with him to reconsider. Carnarvon agreed to ONE MORE SEASON. So on November 1 they started digging again. And on November 4 they found the stairway that led to King Tut’s tomb! One of the greatest discoveries of all time was made possible ONLY BECAUSE OF PERSEVERANCE. The NBA Playoffs are in full swing. Some are trying to predict who will be upset and who will make it to the finals. I write this after the first days of the playoffs. Many have predicted that the Cleveland Cavaliers will be in the finals. Time will tell. But you have to win to get there. In Cleveland’s first game they were humiliated, losing 98-80. It was a lopsided game from start to finish. Yet Cleveland has Lebron James, who is considered to be the best player in the NBA. Without a doubt he is the King of Basketball. So why did Cleveland lose? Simple. No help. Winning is a team effort. You could be the best at what you do, but if you are not getting help from the people around you, it’s a no-win situation. That’s how it is in sports and in life. Unfortunately, many will never reach their potential because they don’t have the help of others. Which means we all have the opportunity to help someone go further in life. Today, this week, you can help someone win. Who will it be? For some reason it’s a natural tendency for human beings to make easy things hard. I’m not sure why we do that, but we do. Let me illustrate. When I played football as a kid, there was never an argument over whether or not someone caught the ball. We all knew what a catch was. Simple. He either caught it or he didn’t. No middle of the road, no guesses. Well, the NFL doesn’t agree. Today no one seems to know what a catch is. Just recently in a huge game between the New England Patriots and the Pittsburgh Steelers there was just such a play with 28 seconds left on the clock. The Pittsburgh receiver made a catch just over the goal line for the game-winning score. Oh. But it was ruled a non-catch. I will not take the time to explain the various nuances of a catch in the NFL, but most of us that day simply assumed he caught the ball. And it gets even odder. Later a spokesman for the NFL referred to the non-catch as a catch, only it wound up being a non-catch. Go figure. Seems to me there was a time when we all knew what a “catch” was. Somehow over the years a catch was no longer a catch. Instead, it all has become incredibly and confusingly complicated. Isn’t that what we do on a regular basis in many areas of life? Let’s go a step farther and see how we tend to make the Bible more complicated than it really is. Think of all the confusion around some of the words and topics in the Bible over the last couple of decades. Just a few short years ago, no one was confused over the meaning of gender. Male and female. As soon as a baby was born, we all knew whether it was a boy or a girl. Now some want to wait until the child grows and decides which gender it chooses to be. Now that’s confusing. Marriage is another word. Growing up there were no discussions as to what it meant. From the time of Adam and Eve all the way through most of the 20th century, no confusion. It was always between a man and a woman. Now marriage has taken on new meanings. In fact, some have even expressed a desire to marry their computer. I guess because they spend so much time with it. One more example. In Exodus 20 Moses wrote that we should follow the example of God who “worked”–that is, created the earth and all that is in it over a period of six days. Pretty clear. Work six days, and then take a day off. Not so fast. Along come some scholars to muddy the waters. All of a sudden Moses didn’t mean six days as you and I understand six days. Then why did he say six days? Now I’m confused. Why can’t I pick up my Bible, start in Genesis 1 and read it as a ten year old? My guess is if you had a ten year old read Genesis 1 and Exodus 20 and then gave a pop quiz asking how many days it took God to create the earth, the answer would be six days…without hesitation. Those two chapters are not complicated unless you want them to be. All the words are rather clear, that is, unless you choose otherwise. For me, I am sticking with the simple and obvious. And yes, I may be biased, but in that particular game, the catch was a catch! 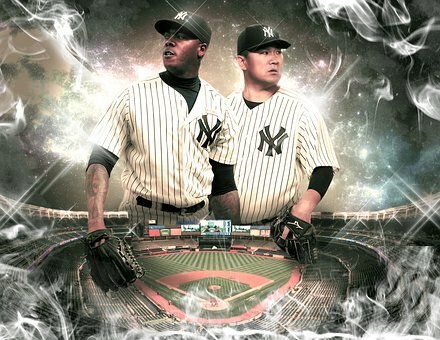 In the recent American League series funeral arrangements were being made for the N.Y. Yankees. And of course, the blame would land on the shoulders of Joe Giradi, the manager. Which meant that his days of managing the Yankees was coming to a close. After all they were down 2-0 in a five game series. And they were playing the hot and heavily favored Cleveland Indians. Yes, the situation was bleak. Which reminds me of David in the book of 1 Samuel. After killing the Giant and serving King Saul his career went south. Saul was on a giant ego trip and was not about to share the spotlight with someone else. It got so bad that Saul began to make plans for taking David’s life. We find David living in a cave. Not the best living conditions, but what is interesting is how bleak David’s situation was. Notice those with him. “Everyone who was in distress, and everyone who was in debt, and everyone who was discontented gathered to him; and he became captain to them” (1 Samuel 22:2 NASB). Clearly the odds were stacked against David. Yet we all remember him as the great king of Israel. Back to the Yankees. They won game three. But the chance of them winning three in a row to win the series 3-2 was slim at best. While I am not personally a Yankee fan I became one. I love classic comebacks. And I love cheering for the underdog. One other thing to keep in mind. One of the Yankees’ top hitters struck out 16 times over the five games. In fact, he only got one hit! That in itself is a recipe for disaster. That’s where the team picked up the slack. It truly does take a team. Ask others to help carry the load. Help carry the load for someone else. Occasionally we get to see it played out right on our own TV screens. The opening night of the NFL season was at New England–last year’s winner of the Super Bowl. Fans were greeted with a huge, over-the-top intro hyping how great the Patriots were. Not sure who gets the credit for the idea, but let’s just say it seemed odd. It certainly didn’t reflect the attitude of the coach or the quarterback. The intro was clearly out of character. It was way too much pride in their Super Bowl win. They had already celebrated that back in February. But then, why not just rub it in. Maybe it will intimidate the opponent, the Kansas City Chiefs. After all, New England was favored to win, and some were already talking about a perfect record all the way to another Super Bowl win. Let’s just say that the Chiefs didn’t get the memo. They easily handled the Patriots that night. For New England it was utter humiliation. The celebratory intro made it worse. To be fair, they could have done a pregame celebration with more dignity. In fact, pride is not always negative. For instance, we appreciate people who take pride in their work. So pride can be positive. The pregame celebration could have focused on the fans, the attitude of some of the players, the hard work put in at practice, and a host of other things. Yes, the team was down 28-3 late in the game, but why not take pride in the fact that the team never gave up? At any rate, the whole thing seemed to promote more arrogance than gratitude. At the end of the day, you have to wonder if all the pregame hype had not actually worked against the Patriots. We’ll never know. After a few games they are still struggling. But we do know that it’s good advice to let someone else toot your horn. Pride in the form of conceit and arrogance is never appropriate. To others it’s always out of place. Now keep in mind that we are talking about one the greatest sports franchises ever to come along. Even they seemed to be oblivious to their uncalled for boasting and pride. Which is a reminder to us that pride is never far away and does indeed precede destruction. Let’s be honest. We all need someone in our lives who believes in us. Actually it could make all the difference. John Lynch is a former NFL football player. But let’s start at the beginning of his story. Lynch went to Stanford University to play football as a quarterback. However, he never made it onto the field for the first two years. After his sophomore year the coach suggested that he move to free safety, a position on the defense. But still he rarely played. He got on the field only about thirty percent of the time. Since he was also gifted at baseball, Lynch decided to go pro and signed a contract with a professional baseball team, the Florida Marlins. This happened at the same time Stanford got a new football coach, Bill Walsh. Coach Walsh got wind of his decision to leave and called him into the office. Walsh had just spent hours reviewing the team’s game films and was convinced that Lynch was the best defensive player Stanford had. That day Walsh persuaded Lynch to stick with football. As they say, “the rest is history.” Lynch went on to play in the NFL and become a star player for many years. Of course, that doesn’t mean his path to stardom was easy. In his second year in the pros he did not even know if he would make the team. Once again, a new coach arrived in town and saw his potential. John Lynch repeatedly discovered the power of others. His rise to fame may never have happened without the influence of others, particularly those 2 coaches. In the Bible it’s rather amazing that one day Jesus looked at a fisherman named Peter and saw incredible potential. And then He invited Peter to join His team. He became one of the 12 disciples, wrote 1 & 2 Peter, and became one of the pillars of the early church. Later the apostle Paul met a young man, Timothy, and invited him along to participate in the ministry. Timothy became Paul’s ministry assistant and the pastor of the church at Ephesus. Sometimes we simply need the right people around us. People who see potential in us and believe in us. You can’t always control who is in your life, but you can pray that God would send the right people into your life. So that you too can experience the power of others! Sleep is a funny thing. We all need it. Yet many love to talk about how little they need. It’s as if you win some sort of medal for needing so little. Sort of like being busy. No one wants to admit a lack of busyness. Somehow needing as little as five hours of sleep a night raises one’s value. Growing up I was not allowed to sleep in. It was a huge sin to sleep until 7am. Fortunately for me I was always an early riser. Add in working in construction since the age of 16 and I was up at 4:30 or 5. That just meant I had to go to bed earlier. As I age I still love to get up early, but I still need a good night’s sleep. Yet the stigma of needing 7, 8, or even 9 hours of sleep still exists. Perhaps it’s time to shed that line of thinking. Great athletes like Tom Brady goes to bed regularly at 9pm. Now stop and think about that. Sounds a little extreme. Yet Brady who has attained the highest level of an NFL quarterback wants to play as long as possible. His health routines are legendary. And today at the age of 39 he is arguably playing his best football ever. That is unheard of. While his sleep routine is not the only part of what he does, it is an important component. One that many of us routinely overlook and devalue. Jesus also valued sleep. His disciples even found him taking a nap in the bottom of a boat during a huge storm. You must admit, storms are very conducive to sleep! The bottom line is we are all different. Most of us will need anywhere from 6-9 hours of sleep. Sleep matters. It affects your productivity. And you can tell. Even if you wouldn’t admit it. How do you feel during the day? Maybe it’s time to get a good night’s sleep. And not feel guilty, but better! Anyone who has ever played basketball has dreamed of dunking the ball. But for people like me, who tend to suffer from height challenges along with reduced jumping abilities, it’s out of reach. The basket, that is. But I can jump high enough to touch the bottom of the net. Granted, that’s over a foot away from the rim. And you can’t just touch the rim, you must be able to elevate above the rim. That’s beyond me. So I was pretty impressed when I ran across a video of a guy who is only 5’2” dunking the basketball. That is unheard of. It’s rather incredible, really. Most people at that height would assume it was impossible. Maybe not even try. Obviously this guy went above and beyond expectations. It would be so easy to be like everyone else. To assume it couldn’t be done. But he didn’t sell himself short, and now he amazes everyone who sees him at his game. Let’s move outside the arena of basketball. In fact, let’s go back to a guy named Moses. I bet you have heard of him. Did you know that he almost sold himself short? Thankfully God stepped in and made him go for it. It all started when God showed up one day and asked Moses to lead Israel out of Egypt. Most would have jumped at the opportunity. Not Moses. Moses’ first response was to fall back on what others thought about him. At least his perception of it. First, he was a “nobody.” Because of that he didn’t think anyone would listen to him or follow his leadership. He had no credentials. Now stop and think about it for a moment. You have heard of Moses because he eventually relented and did what he thought he could not do. He did what he was not qualified to do. He did what he thought someone else could have done better. Thankfully Moses trusted God to use him. But what if God had allowed Moses to sell himself short? Many today consider Moses to be the greatest leader in the Old Testament. I often wonder what Moses thought about when he went to bed at night. Perhaps a good question to ask is “Where am I selling myself short.” Maybe it’s time to go out and try to dunk that basketball.